2 MINUTE WALK TO ELVIS' GRACELAND!! 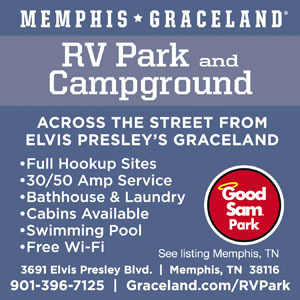 Memphis-Graceland RV Park & Campground is on 19 acres just off Elvis Presley Blvd across from Elvis Presley's Graceland & The Guest House at Graceland Resort Hotel! 10 minutes from Beale Street & downtown Memphis. Location, location, location!! Well worth camping right at the door to Graceland can’t beat the location. You can walk directly to Graceland. It is a great location. Sites are narrow and the staff is great. We stayed for 5 nights at this well-located campground. Check-in was unimpressive but the rest of our experience was terrific. Walkable to Graceland. Had a pull through for our 40' Class A. Site was adequate for our needs although a little muddy. We were close to wash rooms that were clean. You can walk from RV park through gate to Graceland entrance which is convenient if you want to take the tour. Neighborhood outside the park not the best area but felt safe inside campground. Good areas for dog walking our miniature Schnauzers. Would stay here again if we came back to Memphis. Easy to get to, park was hard to get around in, the directions given was not very clear and the streets not marked with arrows indicating direction of travel, so if you missed your turn it was hard getting turned around pulling the RV. no assistance given by park staff. Exceptional in every way. Great restrooms. Great site. Walk through the parking lot and you are at Graceland. Super nice people. Nothing more that I can say. The best thing about this park is its location. You can easily walk from the site to the ticket booth for Graceland. A shuttle takes you from there to the tour. If you are going to Sun Studio, you can also walk from your site to the shuttle bus to take you there and then to Beale Street. If you want to have some excellent BBQ you can call Marlowe's and they will send a Pink limo to your site to pick up and bring you back. Friendly staff, many shaded sites. Sites are gravel and many are not easy to get level. We will never stay here again. The staff wasn’t helpful. The spaces were very small, couldn’t use our awning. The showers were small and need quality repairs. Wifi didn’t work. Their staff told us we had to call a 1-800 number for help, they couldn’t do anything. No cable, just antenna. Not worth the money. 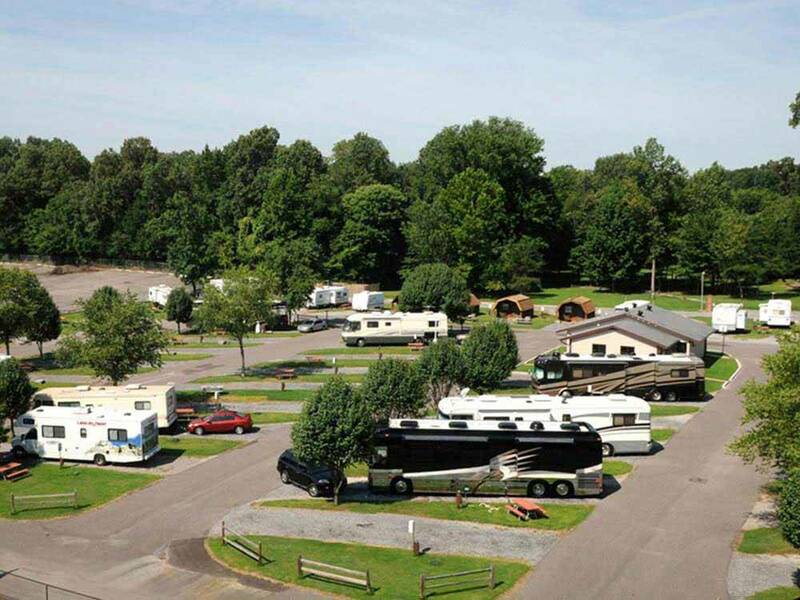 We moved 9 miles down the road and got a much nicer RV park with more amenities for less money, and still real close to all the attractions. Reservations were easy and staff was very pleasant. The park was clean and had a mini park for the kids to play. The bathrooms were clean and there was warm water when we showered. The only downside is the the park is adjacent to the Graceland parking lot which is not a nice aesthetic. Nice enough campground. Absolutely nothing bad to say, just reserving a star for an exceptional campground. Would most certainly stay here again if on a stop over. Now, if you are an Elvis fan you must stay here. The campground is indeed a 2nminute walk to The new Graceland exhibits.....if you walk real slowly. A normal pace will put you at the exhibits in less than a minute. You will be parked in the shadow of the Original Heartbreak Hotel, at least until they tear it down, and it literally is a 2 minute walk to Graceland, the house, although I believe you have to take a tour starting at the Graceland exhibits to actually get into the house. Make sure you take the free ride in the pink Cadillac to Marlowe's restaurant. Food is pretty good, the ribs were excellent, and it was just fun to have the Caddy pull right up to your campsite. Restaurant is only a 4 minute ride. All in all a very fine place to stay. If you are going to Memphis for Graceland it IS the place to stay. You can walk to the Graceland Tour and Museum in less than five minutes. And it is only a ten minute due to traffic ride to Beau St for a great night of entertainment. The ONLY PROBLEM is the sign next to the road is small and you have to really be looking for it.. The campground is BEHIND the Heartbreak Motel. We drove by it twice before we finally seen the sign. Well worth the finding trouble. It cost so much to park at Graceland that it almost pays to stay here just to save money. A little difficult to find, entry sign wasn't easy to see and it just doesn't look like a location you'd expect an RV Park as it is down town and right across from Elvis estate. RV Park was relatively neat and easy to get in and out of and you can't ask for anything closer to Elvis tourist attractions. WE did find getting into Elvis attractions requires internet reservations (odd?) and were expensive so even though we had time to see some we never did but if you love Elvis this would be the place to be. This park was clean, bathrooms were clean, security was always around. Check in was fast and easy, friendly people. I always felt safe in the park. I would recommend this park. Easy access to all things in Memphis. The RV Park at Graceland was very convenient to visiting Elvis Presley's home. The park was nicely tree-lined, clean and secure. If you are planning to go to Graceland, this really is the best accommodation option because it is within walking distance and you can come and go as you like throughout the day you buy your ticket. Clean restrooms and laundry. My electric hookup was worn, lose outlet, reflected older utility equipment. Still functional. Staff competent. Some pleasant, some apathetic. I think it's the best place to stay if you want to see Graceland. Very convenient for that. I'm not sure what happened, but my experience with a 3 night stay was quite different than the other reviewers. Security does check for a pass at the gate, but there is no monitoring of the grounds. During a rainstorm, a group of tent campers moved in under the public covered kitchen area near the pool and took it over, tents and all. Site was time worn gravel, mixed with mud and it took a bit of effort to stretch a 20 ft section of sewer hose to the dump connection. Plus, when we open our door, we were looking and smelling the neighbors sewer connection. Wi-fi was acceptable for an RV park ( slow when no one around, but unusable evenings due to crowding. Along the back side road where we had to come in there were several full time residents parking on both sides of the road, making it extremely difficult to squeak between them. Office simply said " will tell my boss". Next day they were still doing it. I watched other arrivals experience the same problem. No cable TV but local reception from the antenna was better than many RV parks we have been at with park cable. In trying to be objective, I really feel the only thing going for it is the location - walking distance to Graceland. With the heavy volume of traffic on Elvis Presley Blvd it is quite difficult to turn into and get out of the park. Construction across the street on Heartbreak Hotel doesn't help. It's all about the location. Site was fine. Staff very friendly. Walk to Graceland and only about 15 minutes to downtown Memphis. Another reviewer commented about never ending Elvis music being played, but we did not find this to be the case. Stayed for 3 nights. Would stay here again. Fun to stay here with everything named after something Elvis. Facility was clean, bathrooms spotless. Sites were decent in size. Location is great - next to all the Elvis attractions. Overall appearance though is a bit worn. Easy to get to down town Memphis ... Staff were very helpful and nice to deal with. We felt very safe and well looked after. Great place to camp to see Graceland and surrounding areas because it is within walking distance to anything to do with Elvis and Graceland. Easy hookups and friendly people. Security is very tight, staff is helpful, facilities are very good, laundry was first rate, bathrooms were great, everything is very clean. Trash was put out by the road and picked up twice a day. WiFi was very usable, we used it instead of our Verizon jet pack because it was so good. The only con was one gets tired of hearing Elvis sing whenever one leave the Motorhome.